Joseph Austin Benwell was born on 26 May 1816 at 35 Canterbury Square, Southwark, London, the second son of Joseph Benwell, an accountant, and his wife Charlotte. His birth was recorded in the ‘Register of Births belonging to the Monthly Meeting of Gracechurch Street, London from 1793 to 1837 TNA Reference RG6 / Piece 415'. His family had been active in the Society of Friends, or Quaker, movement since the late 17th century in Berkshire and later in Somerset and Bristol. His father Joseph was born in Yatton, Somerset, but the family resided for some years in London between about 1810 and 1824, where several children were born, before moving back to the Bristol area. Joseph Austin Benwell’s paternal grandfather, John Benwell, was the founder of Sidcot, the Quaker school in Somerset on its re-establishment in 1808, and was the author of the posthumously-published diary ‘Extracts from a Diary kept by the late John Benwell of Sidcot...’ (1825). 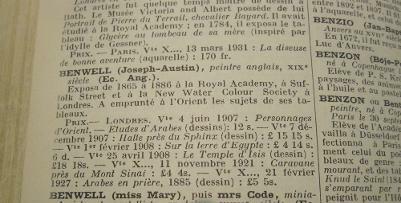 Find out more about Joseph Austin Benwell's family history. 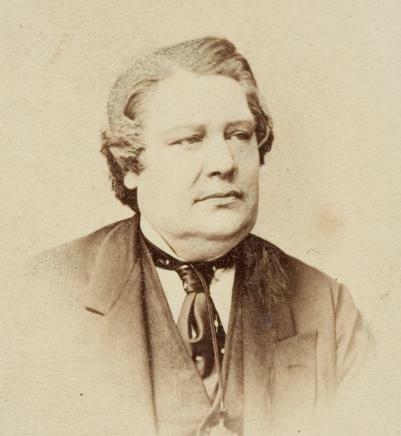 Joseph Austin Benwell married Marian Boulton (1821-1892), also said to be an artist (see below), in Bloomsbury on 13 July 1854. There are no records to date of any surviving children or descendants. Various sources (refer below) give limited information about his travels. Joseph Austin Benwell entered the service of the East India Company in the 1840s. Sources indicate he travelled to India and China before 1853, and was resident in India for a while prior to 1856/57. His coloured lithographs of Florence Nightingale at Scutari, 1855 (Constantinople) and a Crimean battle scene ‘The Heights of Alma- the Day after the Battle, 20 Sept 1854’ indicate he may have travelled overland at some stage, unless they were executed whilst he was back in England. Certainly any overseas trips made in the 1850s would have been of relatively short duration, as records indicate his presence in his home country for much of that decade. Some of his illustrations for ‘Our Indian Army’ depict battle scenes from 1839 and 1845, indicating he may have been in India quite early and possibly explaining his apparent absence from the 1841 census records. References show that he was a resident of Calcutta (refer ‘The Sunday at Home’ 1862, page 760). An advertisement in 'The Publishers' Circle' 15 September 1855 (below left) refers to his 'long residence in the East'. He also lived in Burma - another advertisement in the 'The Athenaeum: Journal of Literature, Science and the Fine Arts’, 7 June 1856 (below right), refers to his “ long residence in India and Burmah”, which must have been before 1855/56, and probably before 1854 (when he got married in Bloomsbury). The subsequent period between 1857 and 1863 seems to have been his busiest and most prolific with regard to production of engravings and illustrations, particularly for 'The Illustrated London News' and the publications of the Religious Tract Society. From 1865-6 he spent time in Egypt and Palestine; he is referred to in the book ‘Under Egypt’s Spell; the influence of Egypt on writers in English from the 18th century’, by Mursi Saad El Din and John Cromer (1991). The book ‘Painting the Holy Land in the nineteenth century’ by Yehoshua Ben-Arieh (1997) refers to this part of his life after 1865 and his interest in Egypt, Sinai and Jerusalem. A short article in the Illustrated London News of 27 August 1864, accompanying his engraving ‘Tunis water-carriers’ states that he “recently visited Tunis, and thence went overland to Egypt”, maybe not the easiest way to get there. Joseph Austin Benwell is also referred to in ‘Who Was Who in British India’ by John F. Riddick. Westport, CT: Greenwood Press,  1998. Joseph Austin Benwell died on 13 May 1886 at Abingdon Villas, Kensington, and was buried at Kensal Green Cemetery, Kensington. His wife Marian was interred in the same grave in March 1892. The 'Journal of the Royal Society of Arts' began in 1852 as the 'Journal of the Society of Arts' (see above extract). It added 'Royal' to its name in 1908, when the Society gained royal recognition. 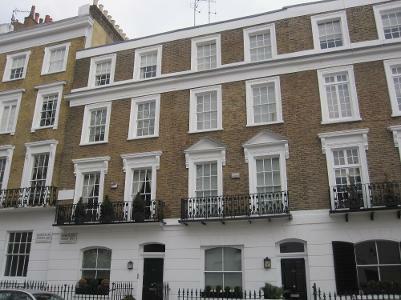 44 Montpelier Street, Kensington, London, home of Joseph Austin Benwell during the early 1870s. "Former residents of the street include the artist Joseph Austin Benwell, a specialist in pictures of India, who was living at No. 44 in 1871, and the painter William Henry Haines, who died at No. 44 in 1884. Another artist, Frederick S. Thomas, was living at No. 32 in 1841. The Arts and Crafts architect James MacLaren lived at No. 40 with his brother Thomas, later also an architect, in the early 1880s. Dyneley Hussey, the music-critic, lived at No. 22 in the 1920s." 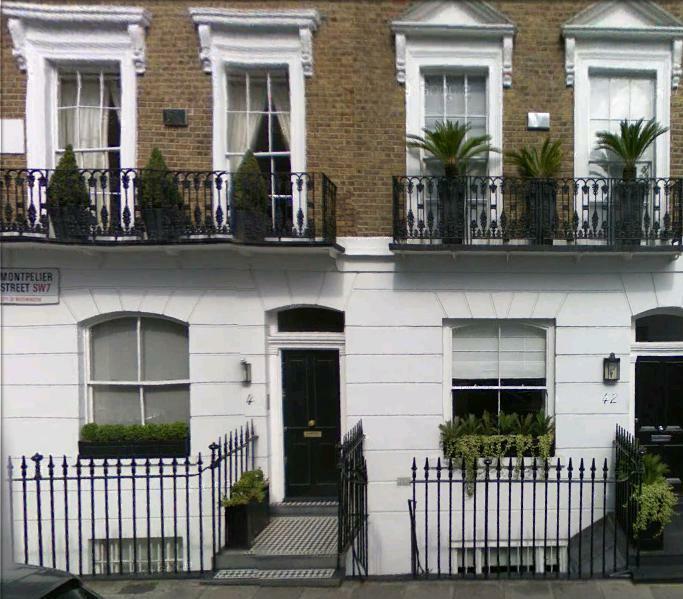 From British History Online: 'Montpelier Square Area: Other Streets', Survey of London: volume 45: Knightsbridge (2000), pp. 116-24. Records indicate that Benwell’s wife Marian (nee Boulton) was also an artist, and it seems possible that they may have travelled together to the Middle East, more specifically Egypt. We know that she exhibited watercolours (Italy and Egypt) in the early 1870s- three of her paintings: ‘Italian Lake Scene’ (1870), ‘Isola Bella, Maggiore’ (1871) and ‘Adrian’s Villa, Tivoli’ (1871/2), are listed in 'Works Exhibited at the Royal Society of British Artists, 1824-1893 and the New English Art Club, 1888-1917’. (J Johnson, Antique Collectors’ Club, 1975). In 1873 both husband and wife had paintings included in the same exhibition- the London International Exhibition 1873 in South Kensington. Benwell, J A - No. 1551 ‘Café Door, Cairo’ 12 guineas (p61, oil). Interestingly, this was an oil painting, a medium which Benwell rarely seemed to use, at least in his known works. 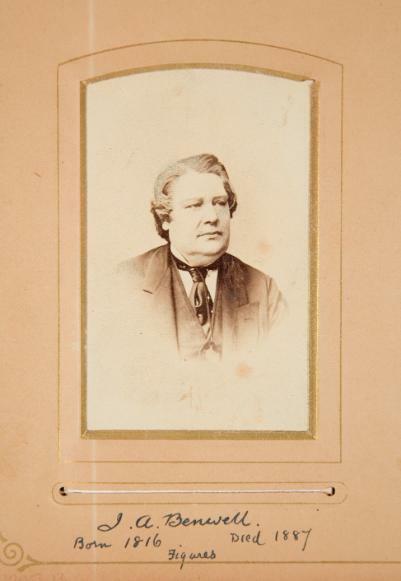 Photograph of Joseph Austin Benwell courtesy of Bristol Museum and Art Gallery.